Ginkgo biloba, commonly known as the maidenhair tree or just plain ginkgo, has got to be one of the most distinctive, and in my mind interesting and captivating, plants in the world. Believed to be truly indigenous to only a single province in China , this 270 million year old species belongs to an ancient lineage of species that have since disappeared for one reason or another over the past few millennia, making Ginkgo biloba (known as a ‘living fossil’) the sole extant representative of what was once a vast and diverse group of organisms. In fact, the ginkgo tree is so unlike any other living plant species that this tree has it’s own genus, family, order, class and division. To put this into terms that may be easier to conceptualize: the only thing that ginkgo trees have in common with other plants is they are also plants. This means that pretty much everything about their genetic make-up, physiology, general behavior, reproductive strategies (including their mobile sperm; a trait particular to ferns, cycads and algae) and even their ability to photosynthesize is anywhere between slightly-off to fundamentally different from any other living plant. Oh, and you can eat it’s seeds. Most people around the temperate world have probably walked within close proximity to a ginkgo tree; they are becoming quite popular as street trees and are popping up in suburban divisions, the islands in the middle of busy roads, in outlet mall complexes and downtown boulevards. The trees tolerate compacted soils, heavy clay, road salt and significant levels of both air borne pollutants and soil contaminates, making them very desirable as occupants of the generally harsh and increasingly toxic environments surrounding pavement and ‘development’ of all kinds. Although the trees rarely live very long from my experience I suppose it’s better to have some malnourished and stressed-out trees than not having any planted in the city at all, but you do have to feel for the standard of living that they are forced to endure. Fruit clusters on a female ginkgo tree taken in early October. These fruits are almost but not quite ripe, and will fall a little while after the leaves drop, usually after a few hard frosts and will remain in good condition on the ground well into early winter. Fortunately, as one may expect, ginkgo trees can flourish when planted in full sunlight in a rich, loamy soil with sufficient levels of organic matter. Just because the trees are able to tolerate terrible conditions doesn’t mean that they don’t outperform themselves when situated in a more pleasing and comfortable environment. Under ideal conditions individual Ginkgo biloba can live for hundreds if not thousands of years and there are examples that still exist in Korea, China & Japan where the tree has been cultivated for countless generations. With lots of space and little to no competition such as when growing on manicured lawns or in parks ginkgo trees can get absolutely massive; assuming a growth form that is entirely their own and unlike any other tree. Although the species itself is quite common in urban environments this doesn’t necessarily mean that it’s an even divide between the genders. Like many other plants, ginkgo trees can be either male or female (they only rarely produce flowers of both sexes on different branches of the same individual) and there is an overwhelmingly larger proportion or male ginkgo trees planted as part of landscaping developments. Why the blatant sexism? 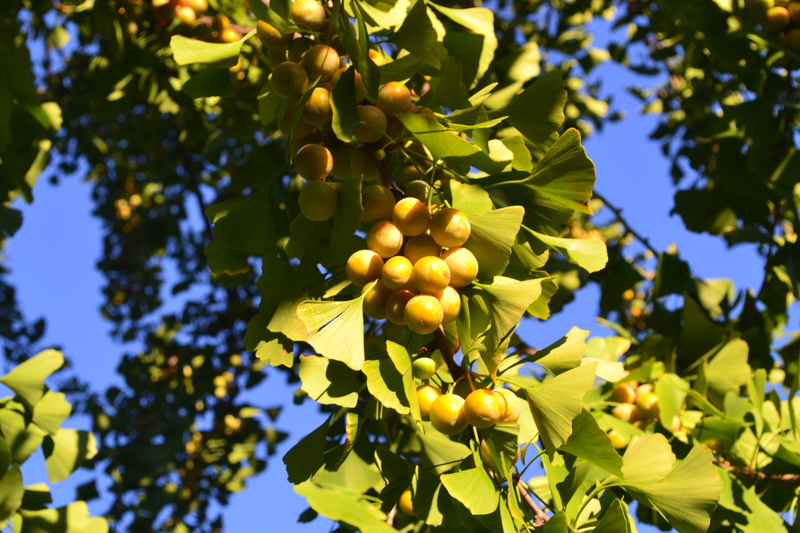 Female ginkgo trees produce juicy, pulpy fruits with a thin, smooth, slightly glaucous skin that changes from bright green to a golden yellow open ripening; resembling small plums. These fruits grow either in groups of 2 or individually on specialized dwarf shoots that grow alternately along shoots. Although they look quite innocent at first – even possibly delicious – the juice of the fruit smells strongly of aged Parmesan cheese and the pulp is acrid tasting and moderately toxic. I have heard accounts of the fruit smelling like either vomit, dog feces or other outlandish claims, but I can ensure you that the smell is much more like strong cheese, perhaps with a dash of special ginkgo-brand funk. 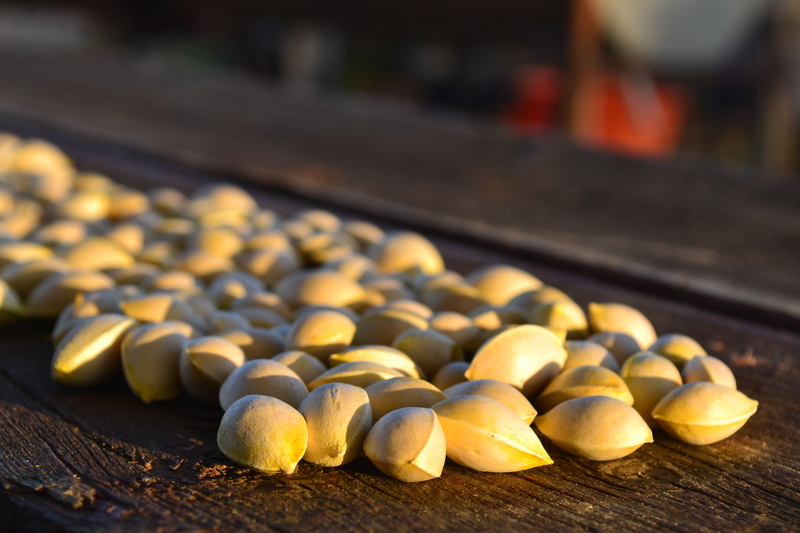 The cleaned seeds of ginkgo fruits, also known as ginkgo ‘nuts’, drying and curing in the sun. Many sources recommend refrigerating the seeds after a few weeks but I have had seeds wrapped in a paper bag in a cold cellar (that isn’t even that cold) for a few months and they are keeping just fine. These ‘fragrant’ poisonous fruits ripen in late autumn, usually dropping en masse along with the leaves from the trees in late October to early November (in Southern Ontario at least). Due to their fairly consistent annual fruit production, female trees are not exactly sought after as a planted specimen and are only occasionally encountered in some areas, often when there are many trees all planted together. This gender bias is of course totally ignorant of the multitude of benefits and uses that the female of this species has. One last downer though: the fruits contain quite a bit of oil, one of these oils being urushiol, the same irritating substance found in poison ivy and poison oak that causes anywhere from barely-noticeable to severe allergic reactions. Despite all of these sensory and chemical deterrents, east Asian cultures have been collecting the small, thin-shelled seed that each fruit contains and using them as a medicinal food for thousands of years wherever ginkgo trees occurred before being planted far and wide from their natural context. It’s a bit of a messy operation collecting the seeds which are often produced profusely by female trees and lie unmolested by fungi, insects or most pests of any kind save for some adventurous squirrels which occasionally eat the seeds. I find some rubber or latex gloves and a plastic bag are your best bet for collecting the seeds in addition to some grubby clothes that you don’t mind smelling cheesy for a little while. The scent from the fruit tends to linger when it gets on fabric or clothing and so you might want to try extra hard to remember not to wear anything that you are particularly fond of when engaging in the participatory act of ginkgo seed collecting. Although it’s best to wait until the late autumn for the leaves to change from green to a bright, brilliant yellow which signals the ripening of the fruit, some fruit inevitably gets knocked off of the trees during the summer and often continues to ripen and ferment on the ground. The seeds harvested from these fruits are just fine from my experience as long as they can easily be squeezed out of the pulp. If you time it just right (pretty much right after leaf drop) then it won’t take you long to collect quite a few of the pistachio-sized seeds which you can then bring home (I would double bag the seeds) to clean. There isn’t really one correct way to do this, so be creative and figure out something that isn’t going to make a huge mess or ruin any of your things. I find putting the seeds in a bucket filled with enough water to cover them and vigorously stirring and sloshing them around with a stick works pretty well. Still wearing gloves, I then pull the seeds out by the handful and place them in an outdoor sink or mesh strainer and then spray the whole lot with a hose to dislodge any stubborn chunks of pulp. They don’t need to be perfectly clean, and will still smell faintly cheesy when they dry but I find this new smell is less offensive than when freshly separated from the fruit pulp. After cleaning them you ought to dry them; I spread the cleaned seeds across a section of pavement on a sunny day and raked them around every 20-30 minutes so they would dry evenly. They’ll be done in a couple hours if it’s nice and sunny. 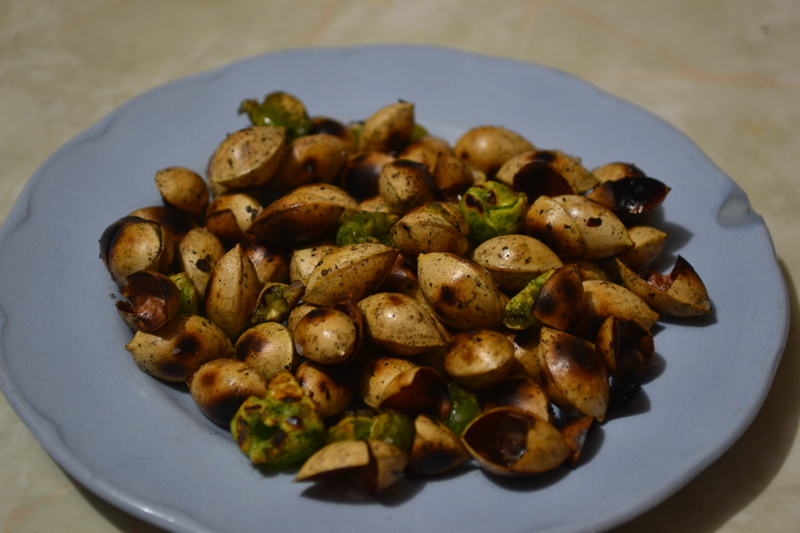 Ginkgo seeds roasted in a dry skillet and seasoned with salt, pepper and a little bit of olive oil. I find that the flavour and texture of the seeds would compliment pasta dishes, soup and vegetable casseroles but I’m sure in a few weeks time if you were to ask me I would have found by then a myriad of other recipes that lend themselves to including their uniqueness. Ginkgo seeds can be prepared in a variety of different ways: boiling or roasting them are common techniques and simple procedures. Some shell the seeds when they are still raw and pan-fry the kernels and others roast the seeds whole and wait until the shells of a few of them start popping, signaling that the inside is cooked through. Make sure to have a lid on your pan if you are going to cook them in the shell on the stove; I still haven’t found all the shell fragments that popped off and fell behind the stove. I prefer to cook them in the shells as this totally prevents the kernel from getting burned or drying out too much from being directly exposed to the heat. I then season them with salt, pepper and a little bit of oil, wait for them to cool, and have myself a nice snack. The shells are thin and somewhat flexible, and are weak enough to be broken with your teeth (or if you are less of a Neanderthal than myself a hand-held nut cracker will do the job but is in all honesty total overkill). Low in calories but high in niacin, anti-oxidants and minerals like selenium, manganese and copper the kernels have an entirely unique flavor; bland but mildly chestnut or potato-like and a texture akin to pasta or tapioca. I have found these seeds to be an addictive snack just dry-roasted in an oiled skillet. However, a word of caution about eating ginkgo nuts: it’s advised by the conventional medical community that you eat no more than 10 seeds per day. This recommendation is based on the presence of compounds called ginkgotoxins which are found in the seed kernels and are heat stable, meaning that they are not broken down and rendered harmless by the cooking process. These compounds interfere with the uptake and dispersal of vitamin B-6 in the body which as you may expect isn’t something that you want to happen. However, I personally find this recommendation to be somewhat arbitrary and that this circumstance is in reality much more variable governed by the specific tolerances that each individual’s body possesses and the specific level of ginkgotoxins present in each seed or produced by each individual tree. I have consumed more than 40 seeds in a single day more than once, but not back to back and have not experienced any of the symptoms associated with 4’-O-methylpyridoxine (Ginkgotoxin) poisoning which includes nausea, vomiting, nervous irritability or convulsions. My personal recommendation is, just like any new food or drink that you are introducing into your body for the first time, give your body a chance to figure out what it’s dealing with and not overwhelm it the first time though. You never know what you may be allergic or intolerant of and so it’s important to be patient with your body and test the waters before adding something brand new to your diet. All-in-all, ginkgo nuts are an easy to identify, sustainable crop from an ancient, iconic tree species that can and should be eaten in small amounts regularly (or large amounts irregularly) as part of a genetically diverse, nutrient-rich diet complete with the benefit of eating wild, unspoiled foods and the satisfaction of knowing that you brought it to the table yourself and no one else was probably going to eat it anyways. All in a day’s work.